A powerful quote and something to ponder in today’s society. The idea that if we truly listen with the desire of understanding the other, that alone can produce change. I don’t know about you but I notice that often conversations seem to involve listening to what someone is saying whilst at the same time thinking about what we want to say and waiting for a gap to say it. Sometimes it’s subtle, other times not so and I don’t believe it’s done with malice, but I get the sense that we listen enough to take in what is being said but that we’re not always fully present. Does that sound familiar? Have you ever been left with the feeling of not really being heard or understood? We’re all human after all and I know I’m guilty of both doing it and being on the receiving end of it! 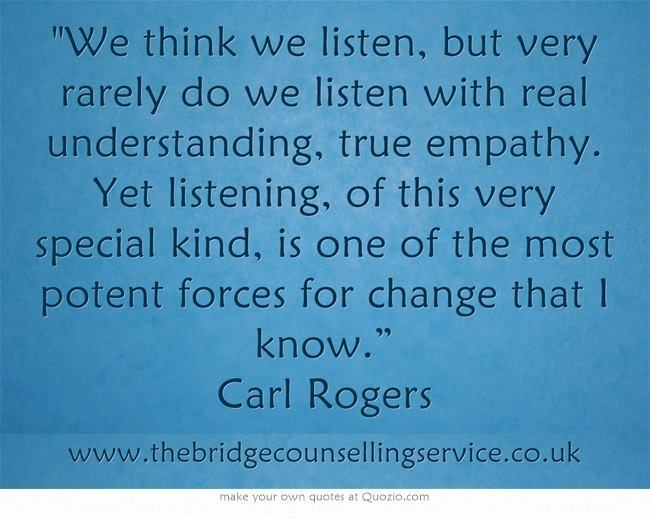 Can you think of an occasion when someone took the time to stop and really listen to you, where you felt heard and got the sense that you were understood? How often does it happen? How did it feel? I find those moments really stand out. What I notice is that feeling heard enables me to hear myself better and in turn be more compassionate and understanding towards myself. 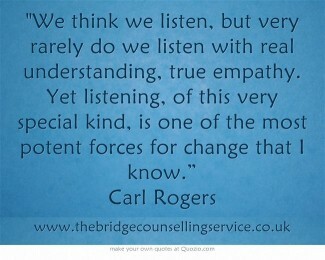 In the world of counselling it is generally accepted that empathy is an important part of therapy. It is however a vital attitude alongside non-judgement and genuineness in Person-Centred counselling. If your counsellor is experiencing an empathic understanding of how you see things, tries to communicate their understanding to you and if you feel that your counsellor has accurately understood you, even to a minimal degree, then change is possible. Like Rogers says above, empathy is a potent force for change. If you’d like to learn more about empathy, you might be interested in an organisation called Center for Building a Culture of Empathy http://cultureofempathy.com/ who produce an interesting magazine with articles on empathy http://www.scoop.it/t/empathy-and-compassion. Comprehensive and sensitive explanation of an incredibly powerful and liberating experience. A helpful explanation of how a client can be carried by showing empathy. Well written and such a valid reminder about what real listening is all about and how it affects people. Thank you all for your helpful and kind comments. It’s much appreciated.